There are times in which your laziness may be costing you money (for examples, see Is Your Laziness Costing You Money? ), but there are also times when your laziness may help you to save money. 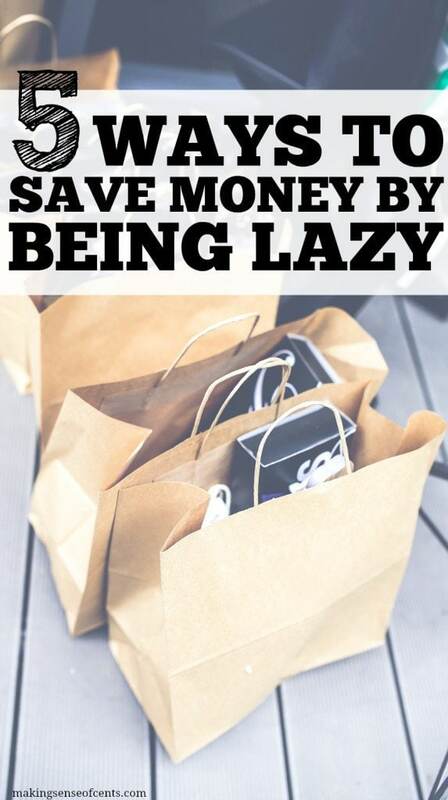 Laziness may be one of the best and easiest ways to save money. Now, that may seem crazy, but it’s true. Yes, I'm telling the truth! Your laziness may prevent you from spending money in certain areas, it may help you decide that you no longer need an item, and more. I'm too lazy to drive. 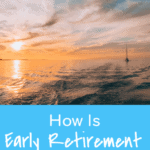 Despite living in an RV, I'm not a huge fan of driving anywhere and that will probably be a reoccurring theme in today's blog post. Since I don't like driving, I combine as many errands as I can into one trip. This limits the shopping I do because I don't want to be out all day long, haha. My husband and I often joke that if it weren't for him, I would never leave home. Ha! I love doing things, but sometimes my laziness takes over! I'm too lazy to go shopping. This is a huge difference from just a few years ago when I wasn’t very smart and wasted thousands of dollars on clothing. Before, I could go to the store and browse for hours, whereas nowadays, that just never happens. Part of it is because I'm too lazy to drive all the way to the store (we live in the RV so malls and stores tend to not be close to the campgrounds we are at) and also because I don't feel like browsing around for hours. Take where we're at right now for an example: The mall is about 1.5 hours roundtrip from where our RV is, so shopping isn't at the top of my list. With hardly ever going to the store, I hardly ever buy things for myself. 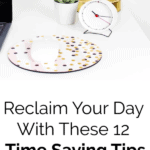 This helps me save money and prevent clutter. 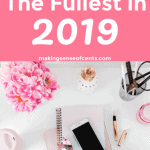 This has also helped me delay purchasing certain items I thought I “needed.” By thinking about a potential purchase for a longer period of time, I have come to realize I don't need a lot of the things I once thought I needed. I'm too lazy to get my hair cut. Okay, this is one that may need to change. My hair is now extremely long and while it still is somewhat healthy, I do need a trim, at the very least. I haven't had a haircut in over a year. A lot of this has to do with the fact that I love my hairstylist in St. Louis, and I'm too afraid to switch to someone new. I'm going back in May, so I'll definitely make an appointment with her when I'm there! I'm too lazy to have a gym membership. This has partly to do with how I don't like to drive, but I also don't like to drive in order to get in a workout. There are many ways to exercise for free. Living in an RV definitely helps because I can exercise in new and awesome places all the time. 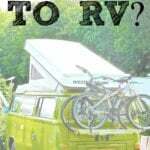 We like to park our RV in places with immediate access to trails, and having that option is really awesome. In fact, right now we are at an RV park that backs up to a state park, which backs up to a national park. Can't beat that! From this spot, we are able to go hiking, mountain biking, road biking, and more. I'm too lazy to get my nails done professionally. According to Wisebread, the average woman who gets manicures and pedicures does so every two weeks, with an average cost of over $1,300 per year. I've only had my nails done professionally less than a handful of times. But, my nails are always done, because I always do them myself. It takes way less time and is super affordable. Has your laziness ever helped you save money? What are other easy ways to save money? I hate driving to the gym. Not because I don’t want to drive or go, but it’s just one more excuse NOT to go 🙂 As for the manicures, I’m working on finding a great alternative to going twice a month. I can get away with a once a month or every other month pedicure but I hate my nails looking a mess. Do you use regular polish or gel polish at home? Having a treadmill set up at home is a great way to stay on your a game in terms of doing cardio first thing in the morning on an empty stomach. Many people feel like yourself and don’t want to drive to go to the gym. Have you ever thought about investing in your own home gym? Sometimes it is good to go to gym because you feel the positive pressure of being around people which will quietly inspire you to go the extra mile in your workouts and pre-workout and post workout cardio. We save a ton of money by staying home most of the time. If we weather is nice we like to be outside at the park or the beach which are free. I didn’t realize people got their nails done so often! I get mine done once a year at most for a treat. Otherwise I don’t really do them at all. I don’t like the feeling of nail polish on my nails so I just try to keep them neat. Yeah, I had no idea either. That’s a ton of money for nail polish! I am also too lazy to go shopping–especially now that it means taking two little kids with me. And I’ve never had my nails done professionally in my life! Ditto on the kids’ impact! I don’t think kids cost nearly as much as people say, because it’s so much work to take them to stores and restaurants. It saves us money because we have to be purposeful with every grocery trip and don’t do any recreational shopping. And what parent has time for hair and nail salons? I’m too lazy to go to work, so that’s why I’m starting a blog instead. I hope it saves me money! Okay, so it turns out a blog is a LOT of work, but laziness does fit in there somewhere for me :). LOL! LOL I hate driving & shopping. I have started doing my own nails as well due to just being too busy to go sit in a chair for a freaking hour! LOL! I can relate. I get too lazy to go to the store, so I end up digging through our pantry and making meals for a while. I’m also way too lazy to get my nails done most of the time – who has time for that?!?! Wes usually has to drag me to the store. I hate going! Yes! I’m also too lazy to drive sometimes…okay most times! I think that is one reason I save money, because I don’t tend to go out. I pretty much go to work and then go home. I need to find free things to do though, because you can’t stay home alllll the time. I used to get my nails done all the time while I was in college. Now that I just don’t want to spend my free time in a salon it’s amazing how not doing something has made me not miss it AT ALL. I get lazy when it comes to going out to buy things and end up shopping online, which works out because then I get extra savings from being able to use online coupon sites. When I was in college for awhile it would just be once a month or so you know just to have something pretty, but it got to the point where I’d get them done two weeks or SOONER! The nail polish would chip or my nails would grow out too long. And each time I went I’d pay 50 for a mani pedi. I know it was so expensive. Now then I wasn’t as careful with my money as I am now, but still I would have probably rather had that 50 dollars in my pocket. Everyone makes mistakes. I was horrible with money when I was in college. It’s amazing, I look back at all the dumb ways I spent my money and how much I’ve changed since then. I can’t believe I was ever that horrible with my money. I feel the same way. I’m glad I realized it fairly quickly! Girl, I hear you on this one. I hate browsing stores to and it resulted in me creating a capsule wardrobe of sorts without even realizing it. I wear the same type of outfits because I purchase multiples when a do shop so I hopefully don’t have to do it again anytime soon. My last pro haircut was in 2013, I just trim it myself and I only get a professional pedicure 2 to 3 times a year and maintain it myself during warmer months. It’s all about what’s important to us and obviously these aren’t at the top of my priority list. I brew my own coffee daily. Feel too lazy to go to a coffee shop – which is a waste of time and money. I am too lazy to go out to eat and I love it. I would eat out all the time and now I don’t enjoy it very much. It saves time and money and my husband and I eat at home together a lot and connect more. I just purchased a new, old fashioned Pyrex coffee maker and I rarely buy it anymore. Brewing it at home tastes better and costs me a fraction of the price! I know plenty of women who are dedicated to getting their nails professionally done every two weeks (if not every week). It is definitely a splurge that you have to really value in order to make it worth it. Otherwise, painting your nails at home saves so much money. Or go natural and don’t spend money painting nails at all, right? Everyone has different preferences. For me, painted nails is a part of my personal style. Boy, can I relate to this! Some days I go as far as to convince myself that not showering is saving money and helping the earth. Thanks for bringing ” lazy” out in the open! Hahahha! I’m glad everyone is making me feel normal. I was a little afraid of how this post would make me look. With two little kids it is SO much work to get out of the house. I’m too lazy to take them out of the house on day adventures very often and that saves us a bunch of money. When I do take the kids out it usually involves coming home with the some impulse purchases that I didn’t intend on: craft projects, snacks, bottled water, etc. Once I even forgot to pack baby wipes so off to the drugstore we went! Wow Michelle I can 100% relate! My procrastination has saved me so much money over the past few years, it’s almost insane. Driving: check. Shopping: check. Haircut: check! One time my laziness also saved me a lot more: I signed for a shady insurance a few years ago. These guys wanted me to start investing all my money with them, but I started low, promising myself I would look into closing some of my less performing accounts one time to start pouring more into that insurance. It turned out to be a very bad investment platform and I lost lots of money, but much less than if I had been proactive in funneling even more money into their stuff. You sound a lot like me when it comes to being too lazy to go to the gym, drive, go shopping ,etc. I can’t relate to the nails thing however! LOL. There are a ton of Youtube workout videos that are great so I don’t need to leave my home to work out. Hahahaha! We sound like twins! My wife has done a great job saving on some “girl” stuff. Doing her own nails, dying her own hair (I know there’s still a cost, but still a huge savings), etc. It really can add up. We’re even now saving on my haircuts by buying a clipper and having her cut my hair. Again, upfront cost, but over time a huge savings! So funny! I am also too lazy to get my nails done. I don’t need another appointment in my life. I also have been too lazy to shop just to shop. The last few months I did because I felt I needed something, but I don’t enjoy the whole process of looking for things and trying on etc like I used to so I’m less likely to do it. At times, appointments make people late. Especially those who work as freelancers that are NOT used to checking in a day job nor being anywhere at a certain time. Appointments can make a person feel nervous and wondering if they’re doing things right. Oh, and I’m too lazy to stick to regular hair appointments now and it has saved me TON! I just go every 6 weeks. On the rare occasion that I go to a store (besides the grocery store, which I don’t enjoy either), I experience a sort of culture shock. Last weekend, my 15 year old needed new shoes – while at the store, my son overheard the mom of another teen boy offer to buy him 2 pairs of shoes, and then proceeded to ask him if he was sure he didn’t have the exact same pair at home. Wow. I live in a whole different world. What a fun blog post, Michelle! I work full time as a middle school teacher. By the end of the day, I’m tired and I’m tired of people. 🙂 This saves me a lot of money. With three little ones, I don’t want to get “back out” to go out to eat, or go the movies, or most anything else. Once I sit down, that’s it. We aren’t leaving. I had rather eat a sandwich than get dressed again to go out to a restaurant during the week. I find I put off getting my hair cut until 2 to 3 months have passed and then I get my money’s worth. I am not a mall shopper or browser which makes hubby happy. His first wife was a SHOPPER. I stretched a box of contacts that is supposed to last 6 months to 1 year over about six years because I’m too lazy to put them in every day… Not exactly a medically sound decision but it worked out fine and I probably ‘saved’ over $1,000 by not ordering new ones. This is so true Michelle! I never looked at laziness as being a money saver. 🙂 I can’t imagine how much money I’ve saved from pure laziness. My big thing is that a lot of times I don’t feel like driving. I typically only drive when it’s time to buy household essentials. I’ve been working on getting out of the house more, because I know that’s probably not the best habit to form. Yeah, I really dislike driving, haha. I can relate to this! At my former job I rarely went out to eat, not because I couldn’t afford it, but I was too lazy to walk out to my car, drive someplace, eat, and then get back to the office on time. I’d rather bring my lunch and relax for that hour. 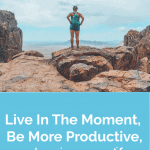 My laziness also made me more productive at work by identifying ways I could streamline and automate processes so I wouldn’t have to do as much manual work. I never really thought of being lazy as saving money. My wife and I are constantly on the go, trying to get 100 things done all the time. Maybe now I can tell her we should stay home more to save money. Especially when she wants to go shopping!!! Wonder how that’ll work out!! Good read! Laziness is not good because it slows down the metabolism and discourages a person from doing their cardio which results in weight gain. We’re human and we all get lazy at times including I. When laziness sets in and sitting at home, it’s a good idea to pull up a Microsoft Word blank document, activate his speech recognition program, and start writing away in your Microsoft Word document in rough draft mold just to get all those rambling thoughts from the back of your mind on your PC screen. Once you have that done, simply edit your content before posting to your WordPress blog website. The beauty about this is that you can work any hour of the day without having to meet a quota and work in your underwear. And yes, being lazy at times does help anyone save money on gas and other things. I love the gym when I get there but the drive is what kills it for me as well. Driving scares me more often than not and I don’t want to put myself through all of that stress for a gym. I love being lazy because it makes me fell productive when I get simple tasks done. Michelle simple yet effective ways. I’m a male but i like the saving gym membership part because i just realize that i could save a lot of money by doing exercise for free. I am also too lazy to go to the movies. I would much rather sit at home and watch from the comfort of my couch. With a family of four, that saves me over $50 easily. I figure the world wont come to an end if I never, ever get my nails done.